Episode 3 of the Podcaster News Show was hosted by me (Jen Thorpe). 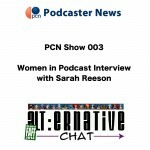 In this episode, I bring you more news about women in podcasting. This episode features Sarah Reeson, whom World of Warcraft players may know as “The Godmother”. She is putting together a huge podcasting project that involves asking players of World of Warcraft 10 questions about their experiences in the game during the past 10 years. Note: The deadline for participation in the 10 Years: 10 Questions project has been extended to September 8, 2014.